Blog What Do Ram Cichlids Eat? 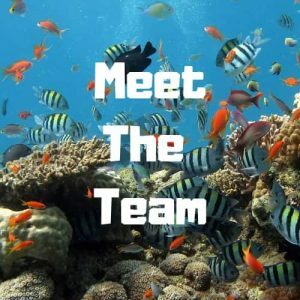 The chances are, if you’re reading this, that you have discovered the delightful Ram Cichlid, and are either thinking of buying a pair, or have already done so! However, you’re also, clearly wondering ‘What do Ram Cichlids eat?’ so, here, let us tell you! What do ram cichlids eat? The Ram Cichlid is an omnivore which basically translates into that they will eat anything and everything you offer them. A staple diet of flake food, pellets, and live foods is the most commonly used diet. Ram Cichlid can be a picky eater and ensuring they receive a suitably balanced diet is important for their survival in a home aquarium. Their diet should, nonetheless, include both meaty and green foods to ensure they receive well-balanced nutrition. This would be a close match to the diet that the Bolivian and Golden Ram would eat in their natural habitats in South America. Here they feed upon wild plant substance and different small organisms that they find on the river bottom. 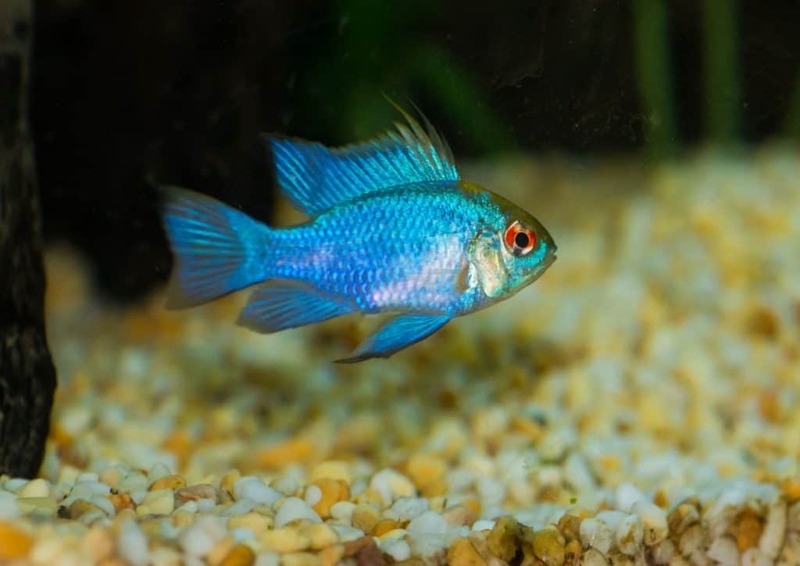 The German Blue Ram and Electric Blue Ram, on the other hand, are both species of Ram Cichlid that have been developed through captive breeding. This may mean, unlike the other two types, that they are more accepting of a variety of foods. Electric Blue Rams love mini cichlid pellets! What Exactly Will My Ram Cichlids Eat? What a Ram Cichlid will and won’t eat will vary depending on the individual fish, and when the food is being offered. For example, newly introduced Ram Cichlids may not eat anything other than tasty treats for the first few days, and may never eat flake or pellet at all. Others, on the flip side, may not take to feeding at the surface, preferring to bottom feed, and may decide all of a sudden that pellet, which they once wouldn’t touch, is perfectly acceptable after all. Having said that, luckily, there is a wide range of foods out there that are suitable for Ram Cichlids. 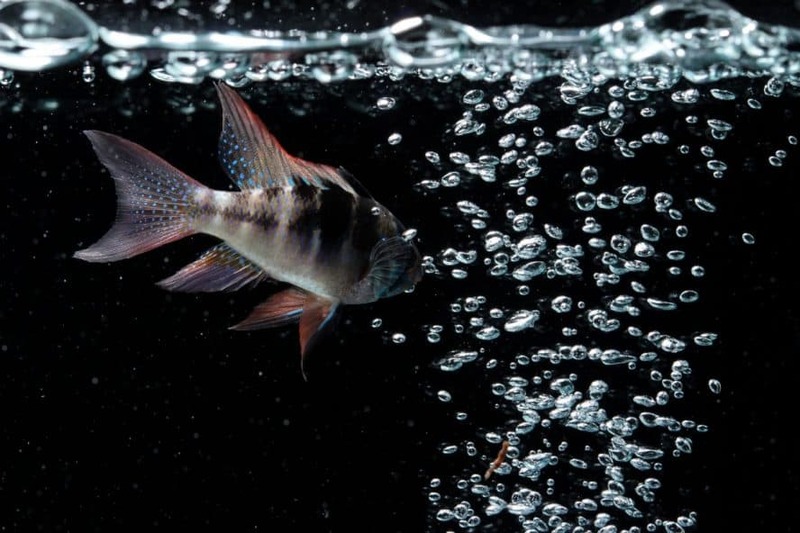 It is worth considering if you choose to feed your Ram Cichlid flake or pellet that they should be of high quality and contain both plant and meaty ingredients. Pellet should also be mini in size as the relatively small Ram Cichlid will not be able to eat the larger varieties. It is also worth perhaps opting for a variety of pellet that sinks, as some Ram Cichlids prefer to eat at the bottom of the aquarium. This is where the Bolivian and Golden Ram would choose to feed in their natural environment. 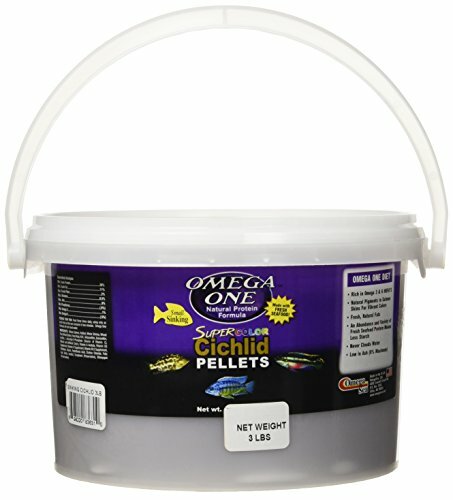 We use Omega Small Cichlid Sinking Pellets as we find them the ideal size for Rams and they float for a good length of time to allow them to feed at their own pace. Regarding the other foods on the list, you will also need to make the decision whether you are going to feed them in a live, frozen, or freeze-dried capacity. Live food is considerably the best option as it will contain the most nutrition but also perhaps the least favorable as it all needs to be consumed before it dies. Buying your cichlid fish food like the one below could save you money in the long run. Freeze dried is perhaps the least best option since a lot of the nutrition is removed during the freezing process. It also needs to be rehydrated before it is placed in the aquarium to avoid causing your fish intestinal issues. However, on the plus side, it is the most convenient as it has a long shelf life and doesn’t need preparation time like frozen does; defrosting. How Often And How Much Should I Feed My Ram Cichlids? If possible, and this is not always so since we lead busier and busier lives all the time, you should ideally feed your Ram Cichlids three times a day. This will ensure that they get the correct amount of food that they need without overfeeding them in a sitting. It is also important to recognize that Ram Cichlids are incredibly timid feeders that do not compete for food well. For this reason it is advisable to watch your Ram Cichlids eating, especially in a community aquarium, to ensure they are getting the food intended for them. How much you feed your Ram Cichlids will, of course, depend upon how many you have. However, a general rule of thumb would be never to feed your Ram Cichlids more than they can consume in around five minutes. As with any other species of fish uneaten food should be removed from the aquarium to prevent it fouling the water. There are many types of Ram Cichlids but all with happily feed on the same foods mentioned above. All grow to the same size which means it’s easier for you to buy just one suitable type of food. If you’re wondering how big they grow, read our Ram Cichlid Size Guide. Conclusion: What do Ram Cichlids eat? Though the Ram Cichlid can be a picky eater, this should not put you off owning them. Ram Cichlids are, after all, a glorious species that has lots to offer. They are colorful, attractive, full of personality, and best of all ideal for community aquariums. Have you read our complete care guide for Ram Cichlids? Click here! Pickiness is, also in general, little more than a passing phase, and when it’s not, it’s easily dealt with. There are lots of different foods that you can offer to your Ram Cichlids out there, in fact, there is sure to be one for them all.